AIT is quite huge, perhaps comparable to the non-residential area of the University of the Philippines Diliman campus. It’s a good ten-to-fifteen minute walk to the two cafeterias and another five-to-ten to the 7-Eleven from the campus hotel. The first night, after checking in, I ate at the closer cafeteria. My Betrothed had warned me that I probably can’t handle most of Thai food. But as a self-proclaimed food adventurer, I risked it. The cafeteria had multiple stalls, each with its own cuisine: “Southern Thai”, Indian, and other mostly halal food. There was a bit of a language barrier, but luckily there’s enough visual aids and it seems most of the staff understands albeit cannot speak English. It’s also a bit unique in that you have to acquire a reloadable RFID card for 30 Baht (refundable afterwards) to pay for your food. You then present the card at the stall you order in and it deducts the amount you owe. My first meal was Vegetable Rice (40 Baht) topped with Chicken Curry (35 Baht). I immediately noticed how much the plate is filled. This is basically an entire day’s worth of food for me. In fact, I was not able to finish it… but not because of the quantity. 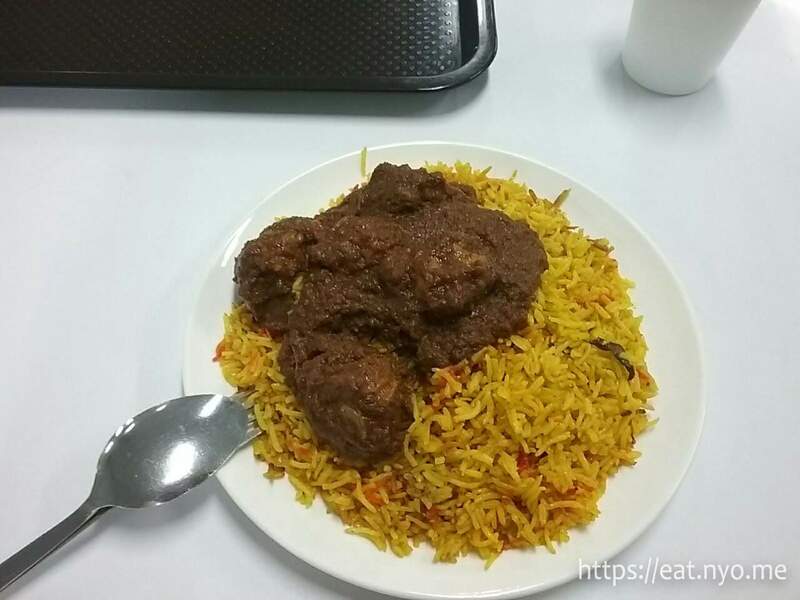 Rather, the yellow long-grained basmati rice was extremely spicy. This was among the worst palate experiences for me, even worse than the self-inflicted suffering I had at Saigon Pho. When I was about a quarter way through, I was sweating and had downed already three glasses of water. The curry was actually the breather. While also spicy, it had a mild coconutty flavor which somewhat helped me carry on a bit more. I did manage to eat all the chicken, but I surrendered after finishing only half the huge plate of rice. I immediately ventured further to nearby 7-Eleven, which I already knew was in the vicinity after downloading a map of the area. Here, I purchased some necessities along with some stuff I hoped will alleviate my suffering mouth. 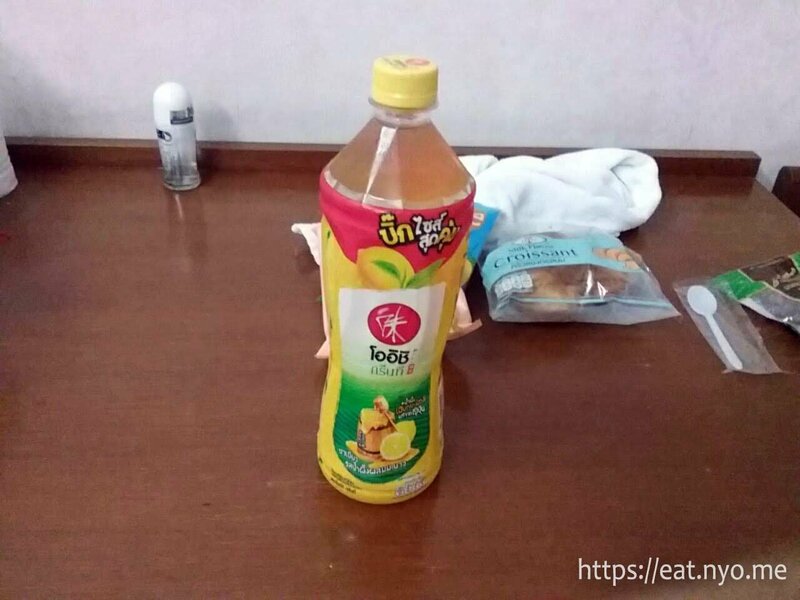 I wasn’t able to take pictures that night because I was in pain, but I did order an ice cream stick (22 Baht), a 800 ml bottle of iced tea (35 Baht), and a spinach sandwich (35 Baht), the first I consumed immediately and the last I consumed as I settled back into the hotel, right before I passed out from the travel. The second night, I went to 7-Eleven to purchase some more necessities and midnight-snackables when I found a couple of students from my workplace who also attended the conference. We then went to the other cafeteria for dinner. 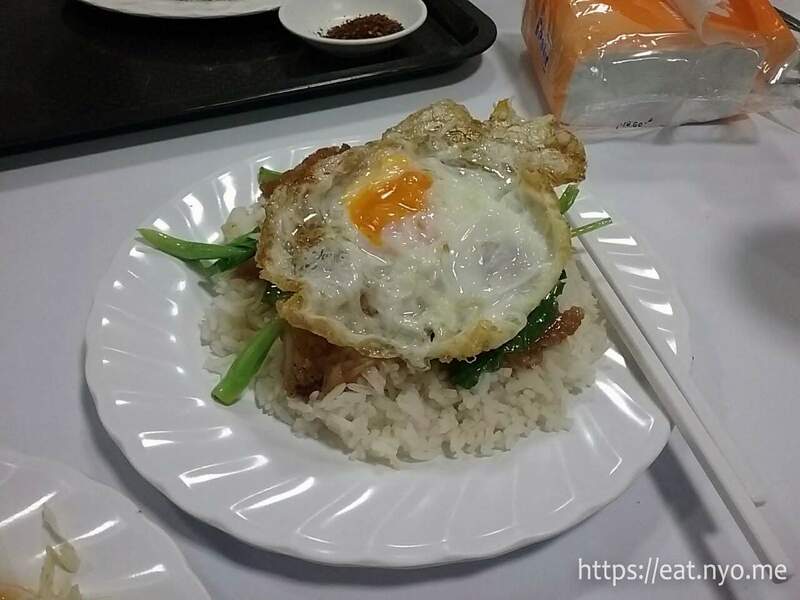 This one was similar to the last, including the payment method, except the stalls offer non-Southern Thai, Chinese, Western, and other noticeably non-halal restricted offerings. This time, I insisted on all my food to be not spicy. I ordered a Stir-Fried Seafood Glass Noodles (45 Baht) and a Stir-Fried Kale and Pork (45 Baht) from a Thai stall. This meal was definitely better than last night’s for me. The Stir Fried Seafood Glass Noodles was similarly plentiful. 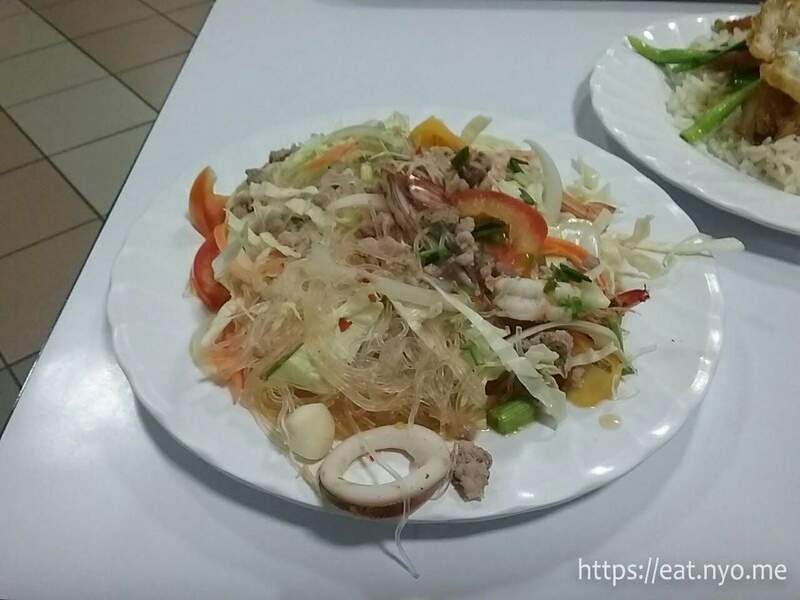 It had not only a lot of seafood toppings including squid, fishballs, shrimp, and some cuts of chicken I believe; it also had a lot of veggies. There is a little bit of spiciness here, but the dominant taste was a sour lemongrass flavor. I don’t really like the flavor of lemongrass, but I definitely prefer this over the previous night’s monstrosity. My other plate, the Stir-Fried Kale and Pork was a generous amount of rice, more than a Pinoy “cup”, topped with the aforementioned stalks of kale and crispy pork as well as an egg cooked over medium. I really enjoyed this dish—it had an especially umami taste that had me savoring the mixture of rice, pork, veggies, and egg. It reminded me a lot of a Lechon Macau dish that I used to always order with a similar toppings (kangkong instead of kale) at a food court stall in SM North EDSA when me, as a child, went there with my grandma. I had leftovers for both my orders which I took back home and consumed entirely in the hotel. Although I have the receipt from my purchase from 7-Eleven, I don’t know which is which and how much exactly each item was. However, I do know these items range between 14 to 38 Baht. 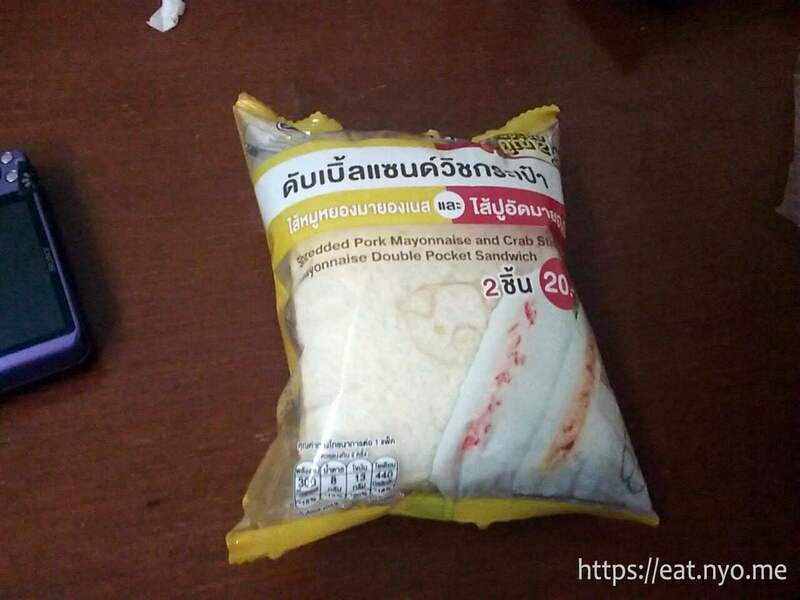 I got a two-pack of Shredded Pork Mayonnaise and Crab Stick sandwiches, I assume 20 Baht. While its packaging is a bit nicer than what we can get locally, taste-wise, it’s not that special. There’s also too little filling in each of the sandwich; I guess similar to what we get here, but definitely not what you get from Japan. 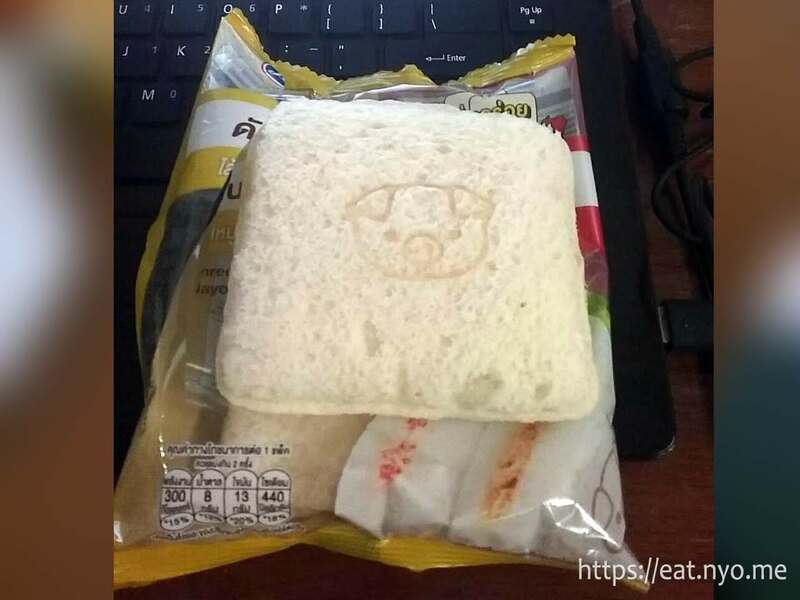 The only plus side is there’s an engraving of a cute pig on the sandwich for the pork-mayo one. Sadly, the other sandwich didn’t have any. Also sadly, these were quite small and not at all as pictured. Even the amount of bread is small. 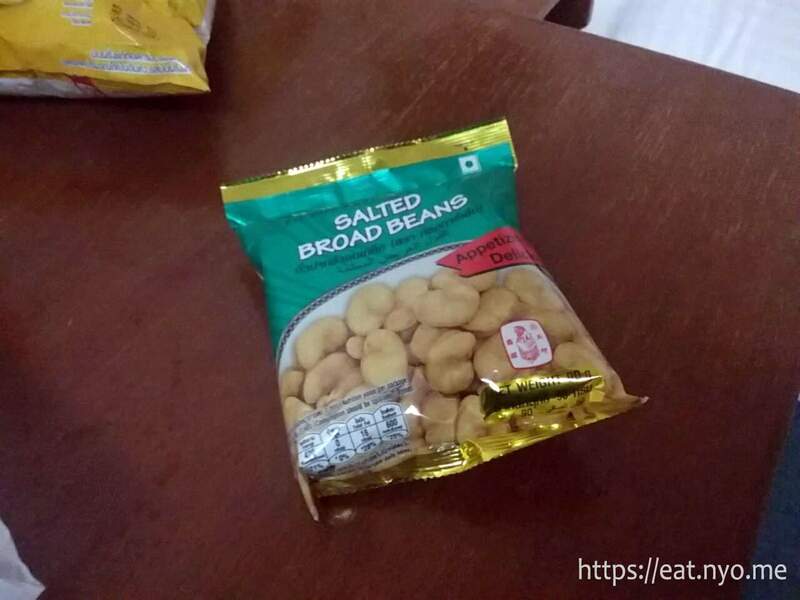 These Salted Broad Beans was my favorite snack for this night. I love beans, especially when deep fried. They had a salty taste and crunch texture, both qualities I enjoy. I can compare it to the “pop beans” our local 7-Elevens have, but a bit less greasier. 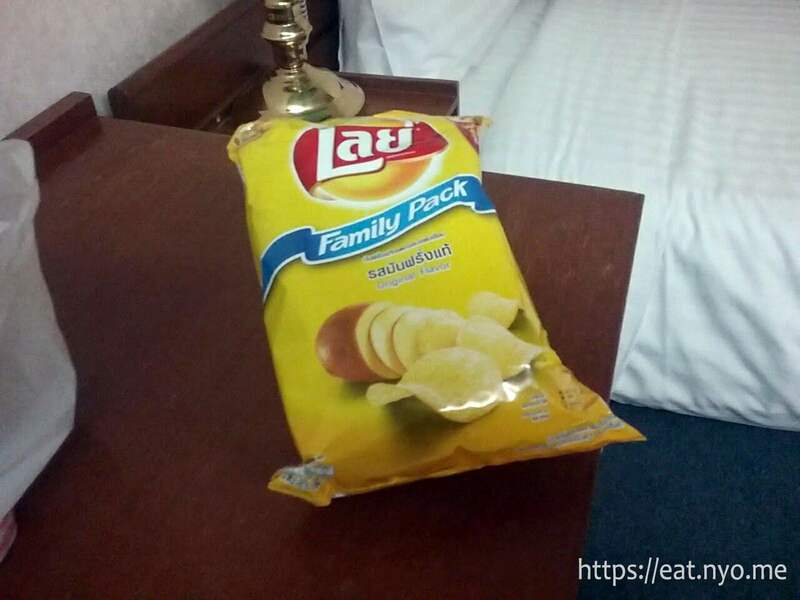 I was curious on how Thailand’s Lay’s Original will compare to what we have locally or imported. This wasn’t as oily and salty; perhaps was “baked”. I don’t like it as much as the oilier, saltier Lay’s Original we can get locally, but I do like the packaging—there’s an adhesive behind that lets you close the bag as you go. I managed to ration this for two nights, granted I had some other snacks and leftovers. 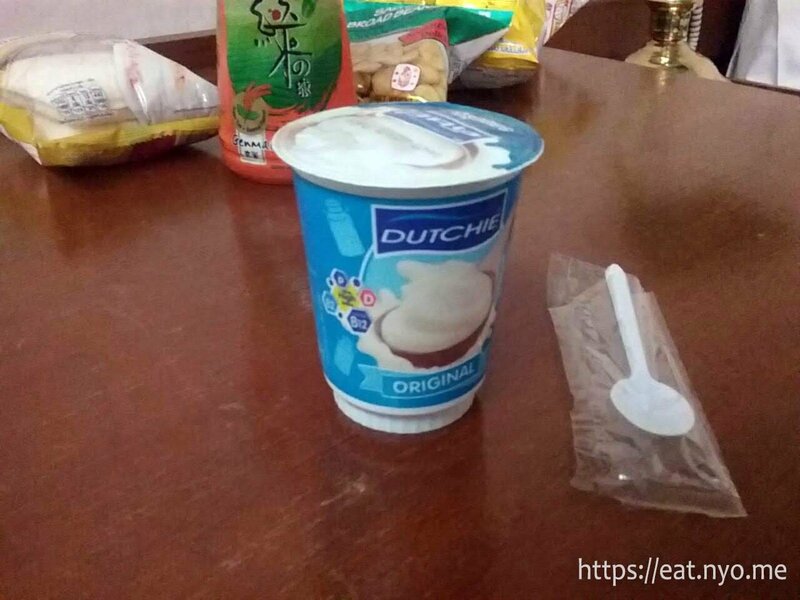 Finally, I got a cup of Dutchie Original Yogurt. Nothing special; it’s sour, creamy yogurt. I think this was 14 Baht based on my receipt, so I guess it’s an okay value. Day two and last day of the conference was also my third night and last day of my stay in AIT. My last supper here consisted of Seafood Fried Rice (50 Baht) from the second cafeteria. This was delicious! 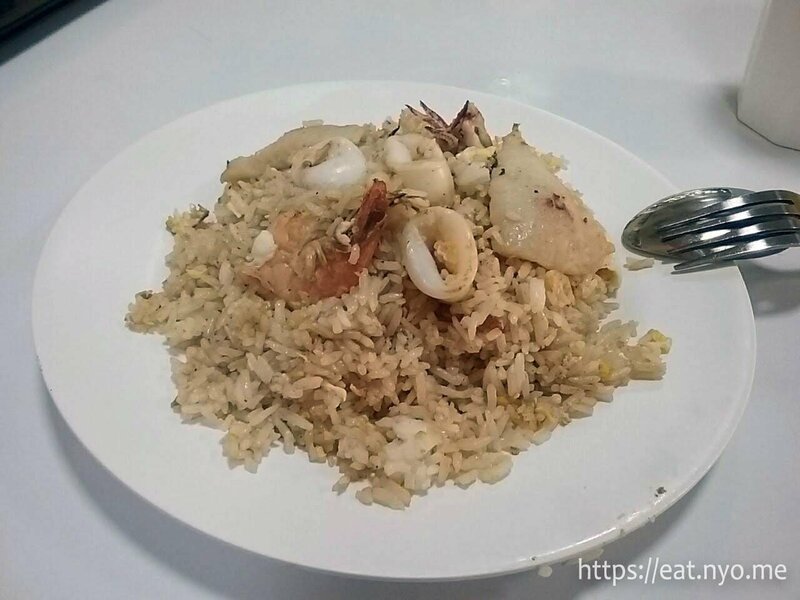 The Seafood Fried Rice was a generous amount of savory fried rice topped with various seafoods, specifically squid, fish, and shrimp. It had some peas sand eggs here and there, and also some slices of chili which didn’t really add a lot of spiciness. It was predominantly savory-salty, which is my favorite flavor profile. And despite me not being a big rice eater, I managed to down this entire plate without leftovers. I guess my only complaint is there’s too much rice for me here over the amount of seafood. I’d pay more for more seafood and less rice. My last 7-Eleven receipt was also difficult to decipher, but this night’s selection ranged from 13 Baht to 30 Baht. I got these Spicy Tamarind for my mom. I don’t know how these tasted like, but I assume these are quite spicy. I’d spoil my adventures in the upcoming blog posts that perhaps 7-Eleven is a better place to get your pasalubong if you’re not going to Bangkok as I was. At least you can get stuff like this here at a reasonable price. I got their Milk Croissant. While indeed milky, it’s still semi-fake in that it’s not at all buttery. 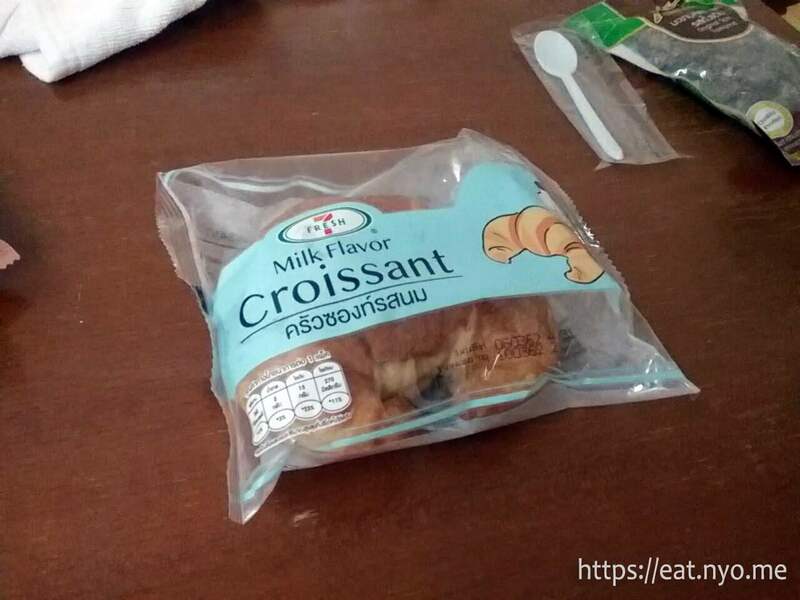 Still, it did manage to be flaky, unlike the fake croissant that our local 7-Eleven serves which only has the shape of a croissant but is in fact plain bread. 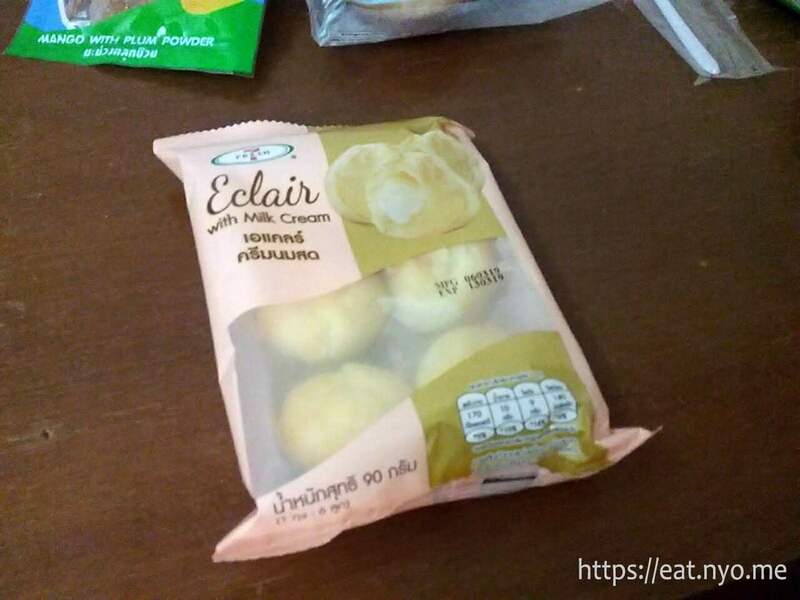 These Eclairs with Milk Cream were okay. They were small shells of soft bread which explodes into a milk-flavored custard. Each piece will last one bite. I’d wish they were a bit more bigger, though. 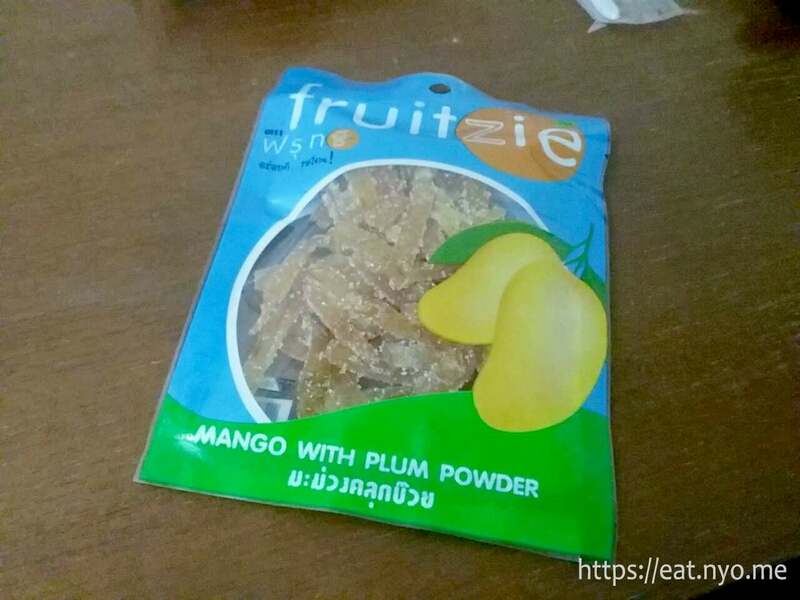 The best random item I got this night and I guess from 7-Eleven overall was the Mango with Plum Powder pictured above. The dried mango portion can be likened to local Philippine dried mango. However, the powder it was covered in was quite spicy. This wasn’t an intolerable spice like what I had the first night. 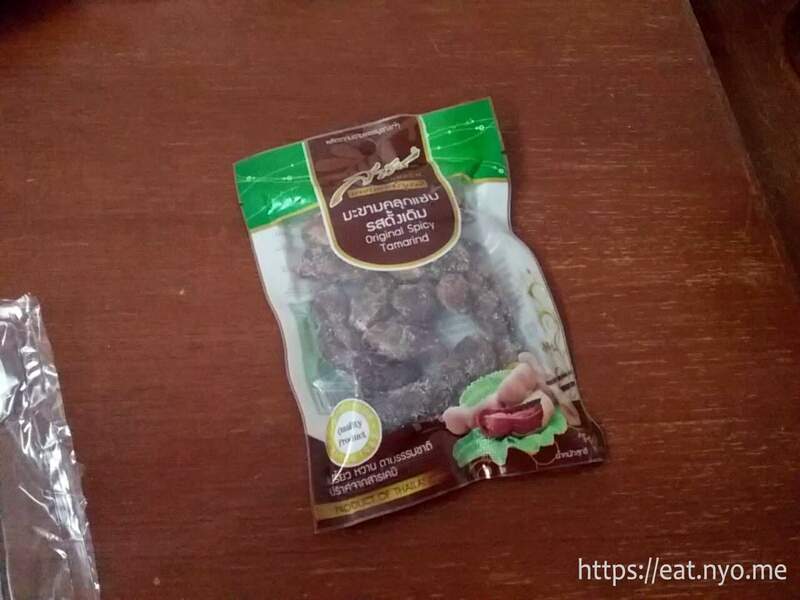 This was actually quite a nice spice, adding some sweetness and making me eat the pack more and more until there’s none. 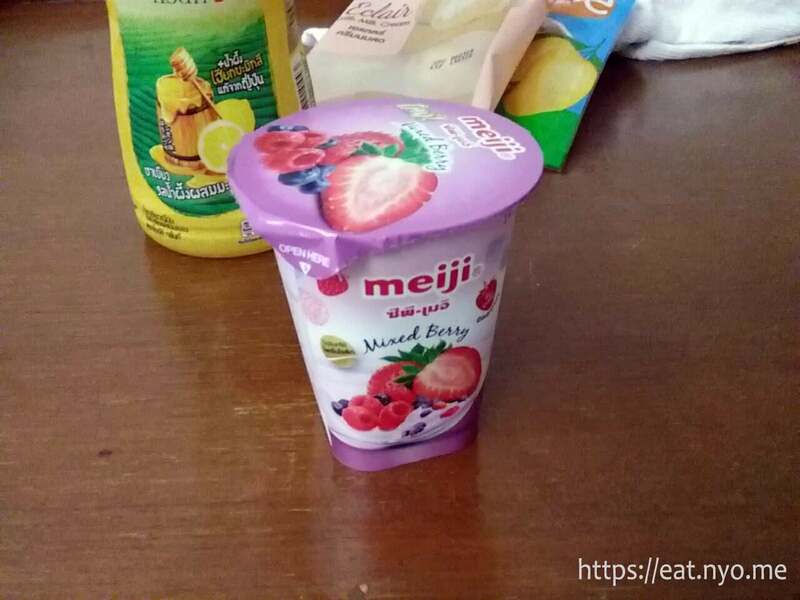 Penultimate item for this blog is this Meiji Mixed Berry Yogurt. Unlike our local… I forget what brand… yogurt available in 7-Eleven, this wasn’t at all sweet. In fact, it tasted more yogurt than fruit; although the taste of berries was present, it was more like a backdrop to the sour yogurt. Finally, pictured above is their Honey Lemon Iced Tea. I don’t know what brand, but this is actually the third iced tea I purchased and the only one I featured. The other iced teas I’ve had were plain (first night) and genmaicha (second night). All of them were 800 mlwhich surprisingly might be the perfect size as I find our 500 ml’s too little and 1 liters too much. All of the teas, including this honey lemon one, wasn’t too sweet. All of them managed to do their job to be refreshing. Overall, the three nights I stayed in AIT perhaps could’ve been better. I could’ve forgone with the spicy rice and curry. I could’ve gone to a not-so-nearby night market that was only open up to the second night of the conference. However, it really was quite an educational experience both from the conference and from the food adventure. I learned that a serving size here in Thailand will actually fill me up. And the food’s actually quite cheap. Each meal averages to 45 Baht, converted to about 75 Php. With the amount of viand and flavorful food you get, I think what’s served here is much better value. I also learned to avoid Indian and/or “Southern Thai” cuisine, or at least ask them to make it not spicy. The 7-Eleven offerings are quite similar to what we get locally. Although the convenience that it’s available round the clock is there, the offerings aren’t that different from what we have. What I’m saying is, it’s definitely not Japan and much more close to home. However, I did notice that, on average, what they carry is mostly more fruity, more milky/yogurty, less sweet, less greasy/fatty, and much more spicy. Also, it’s a good option to get your pasalubong here if you’re not going to get an opportunity to go to Bangkok. The airport and mall were actually quite expensive. Finally, I also learned there’s a bit of a language barrier which poses a challenge when ordering your food. I also get to learn more about this problem in my upcoming posts. Stay tuned for the continuation of my Thailand Odyssey as I spend my last day at Megabangna, a mall close to the Suvarnabhumi Airport. Recommended for: Hungry, spicy food lovers. Not recommended for: The not-too-hungry. Smart nomnomnom tip: The serving sizes are huge and perhaps can be shared.